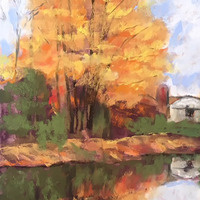 Art Exhibition: "A Sense of Place: Paintings by Patty Mabie Rich"
On display through March 13. Working in oils or pastels, Rich’s impressionist style brings the essence of her subjects to life. Her work has shown at Stone Quarry Hill Art Park, the Tech Garden, SUNY Upstate Library, the Everson Museum and other local venues. Free. For more information call 315-399-4100.